Bengals do inherit some characteristics of their wild ancestors besides the physical ones. The ALC is an agile climbing cat, and so are Bengals. They enjoy being up high, and owners should provide some climbing trees and perches for the cats to play on. This will save the furniture and drapes! 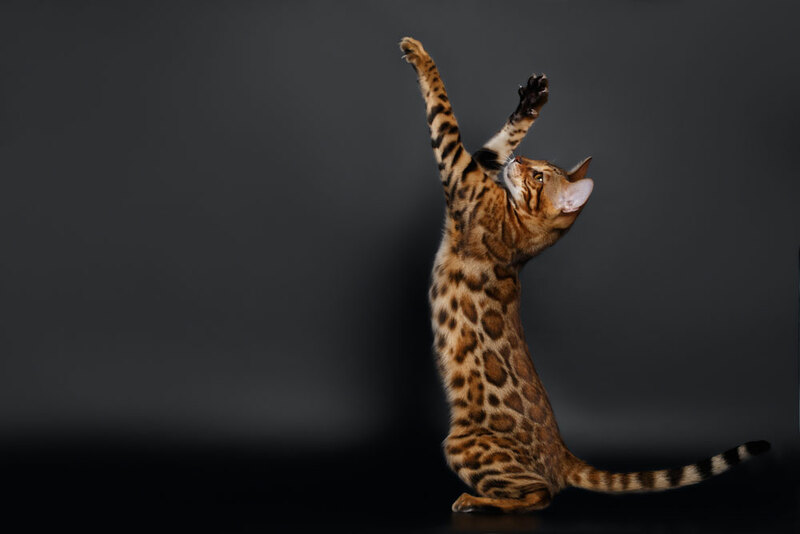 Bengals also do not do well when declawed, as this interferes with their love of climbing and can frustrate them, forcing them to find other outlets for their energy. Declawing can lead to behavior problems in this breed and is not recommended. Bengals are also incredibly active and athletic. They are not a breed for people who want a cat to sit quietly in the corner. Many new owners are unprepared for how strong and lively these kittens and cats really are. They do not outgrow this playful nature. Some people enjoy it, many do not. Potential owners would do well to spend time with Bengals before purchasing one, to see this activity level for themselves. They are not particularly lap cats, they are too busy to spend much time being held and cuddled. Some Bengals eat their food using their front paws; some play in their water bowls and like to drop their toys into the water. This can get a bit messy. Some Bengals will jump in the shower or bathtub with you, some like to drink only from a running faucet. Most Bengals are efficient hunters and are very predatory; sufficient toys must be provided to allow them to have their fun stalking and pouncing. They often carry their toys around in their mouths or paws, and enjoy a good game of fetch. Bengals should not be shy or aggressive; they are very outgoing and bold, with confidence and self-assurance when raised properly by knowledgeable breeders. They are not easily intimidated and often rise to the dominant position in the household. They are sometimes talkative and sometimes just wont get out from under your feet.